During the decade-long Microship project, I published 138 Status Reports as well as a few more general pieces in the old Nomadness series, and for years those have been squirreled away in a rather obscure corner of my website as clunky text pages without any images. Eventually, I want to fold everything into this archival blog, which will interleave all the artificially isolated groupings of material into a single coherent timeline. This one gets to be first, since it was so pivotal. 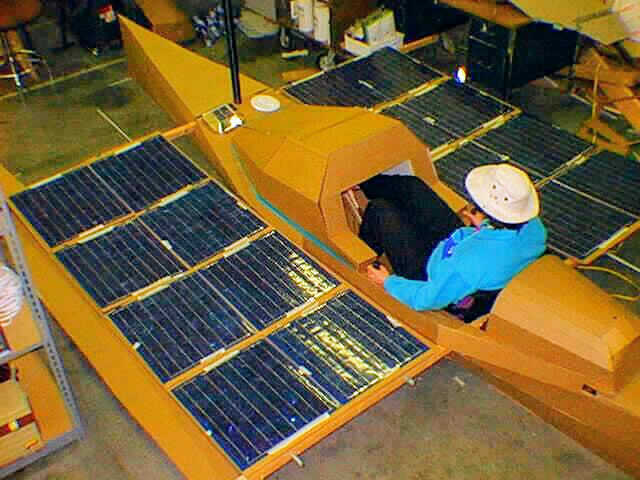 It marked the transition from a frustrating 2 years with a huge trimaran to the amphibian pedal/solar/sail micro-trimaran project that finally rolled out the door in 2001. It was Sunday, March 23, an otherwise uneventful day, and I paced the lab like a caged animal, constrained to a windowless rectilinear space with artificial light, vague dreams of aquatic adventure burbling in my reptilian brain like something instinctual driving me to odd behavioral sublimations that give vent to long-forgotten urges. At the center of the lab stood the boat, Icon of the Dream, covered with dust, tools, respirators, Shop-vac, and the funky detritus of fiberglass hackage. Surrounding the boat on all sides were cluttered benches, shelves laden with expensive nautical and electronic hardware, uncategorizable clutter, chip databooks, epoxy fixin’s, a maze of cables, computers, and STUFF. I paced. I climbed the steps to the boat, paused, and descended. I idly picked up the AIR Marine wind generator and spun the shaft to make the LED flicker. I peered through a port into the aft cabin and stared at the battery bank, putzed ineffectually with the flute for a moment, and scanned the “Fiberglass Projects” list densely occupying one of four whiteboards, hoping as always that I could erase something… but no. I randomly picked up last April’s issue of Sail Magazine and thumbed the pages, absently, as one might flick one’s eyes over a rack of postcards at a checkout counter. Understand, we’re talking major restlessness here. A half-decade in Microship labs or on a quest for same; the bike (the world’s most expensive boom box) playing jazz while mercilessly taunting me with road-dirty wheels and a design optimized for movement. Ah, memories <creak>. Feeling like an old timer lapsing into reverie, I ignored the relentless itch of instincts unfulfilled, consciously turned my back on the TO-DO list, slumped on a lab stool, and started browsing the magazine. Ah yes, THAT article. One of my favorites — the comparison of sailing kayaks: the familiar Fulmar 19, the fast rotomolded WindRider, the kayak-based Balogh Batwing, the racy foiled Triak, and the pretty wood Chesapeake Light Craft SailRig… all sleek, light, fast, exciting boats. <sigh> Memories of the Fulmar adventure with Faun bubbled past my barnacled brain as I read the piece again, lingering on the pictures, recalling the fantasy that started all this back in 1991… pedaling BEHEMOTH up the Wisconsin shore of Lake Michigan while fantasizing about tiny boats… but no, no, stop thinking about that! 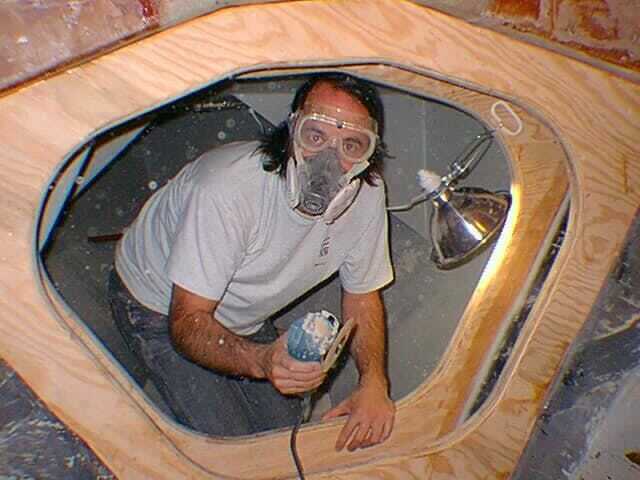 I’ve been there; the Fulmar was too small, THIS is the boat, this is the boat I have to finish NOW. I looked, almost guiltily, at the trimaran and felt… nothing. Wow. Never really noticed before, but gee, now that I thought about it… I really haven’t had much of an emotional connection with this boat, have I? It (not “she”) is a good logical solution to the stated design goal, which had something to do with a trailerable platform for a happy couple on the technomadic adventure trail. But what about the passion, the heart of this whole project? Suddenly alert and suspicious at the pheromonal scent of Major Change in the air, I stared at the boat, then back at the magazine… then back at the boat. The toggling between adrenaline and yawns was too damned obvious to ignore, and I was instantly embarrassed that I hadn’t noticed this a year earlier. When this whole Microship project began, you see, I perceived it quite simply as the aquatic equivalent to my computerized bicycle. 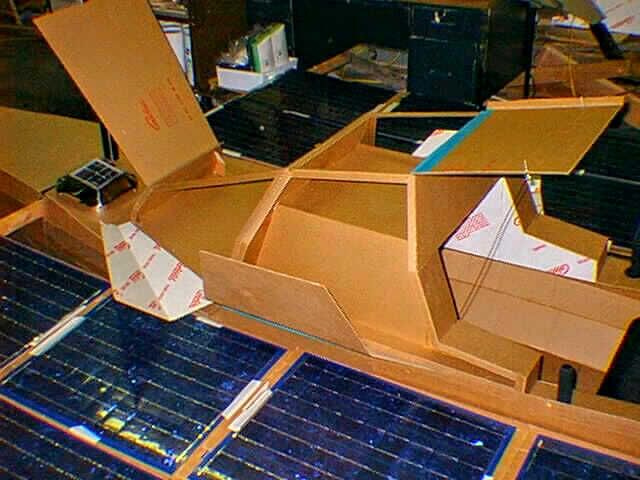 Human/solar, small, way geeky, challenging, light, physically minimalist, small enough to haul out and stash in a host’s garage, and (unlike yachting) approachable by people in the sense that they could imagine themselves doing it. I drew countless sketches of little cats and tris, pedal powered, with a road mode based on pedaling or walking. Then, as the wish list (the BEHEMOTH effect) began to kick in, the boat grew… and grew… from a kayak to a kayakamaran to a kayak tri… to a 30-foot center hull with double kayak amas… to a brief fantasy about a ridiculous amphibian diesel motorhome with hydraulic crossbeams… and then, almost as a backlash, to the Fulmar… which was wonderful but too small for the growing complexity of a project that was not downsized to match (couldn’t sleep on-water anyway). I had a brief adventure and sold the boatlet, embarked on a quest for the ideal trailerable live-aboard-for-two folding multihull, and settled at last upon this unique and elegant precursor to the sleek Corsair F-boats: the one-of-a-kind Hogfish. During that time, I continued building my electronic and control systems, which were to occupy a 10-foot-long, 6-bay pressurized console in the cabin. I acquired most of a 40′ rotating rig and puttered at boat-building, completing the new bulkheads and mast step assembly as well as a few minor additions… but recently the ratio of untouched projects to lab time remaining reached a critical level, and I had to accept the fact that at least a year of work and $15,000 yet lies between here and those first tentative non-electronic test sails. Only THEN could I begin integrating the comm/nav and computer systems that underlie the whole technomadic dream — the passion that drove me to do all this in the first place. But when I wandered the US, much too long ago, it was by bicycle instead of motorhome: the comfort and insulation of an RV would have been stifling; the culture, however pleasant, boring; the mountains and deserts, too easy. A direct comparison to sailing is impossible since there are additional issues of safety, wind, sea state, and the small matter of being unable to step off at one’s convenience to take a break… yet there is one relationship that I have experienced enough to believe correct: the smaller the boat, the bigger the adventure. Since smaller boats are also cheaper, quicker to build, and (if carried to the logical extreme) light enough to schlep around under human power, we can postulate another solution set to the complex formula that is the Microship. Yes, boats. Plural. Suzy and I have been brainstorming, slinging hot glue, and slicing scrounged cardboard for weeks, and the result is a fair sculpture of a Microship-to-be. The new Microships are tiny trimarans based on 18.5-foot kevlar Wenonah “Odyssey” canoes, being built in Minnesota with a custom layup to accommodate some decidedly non-canoe-like stresses. These are lovely hulls, about 36″ max beam, and will be decked over via the Formus “topographic shell formation” process and bulkheaded to add strength and seal off the bow and stern storage compartments. The outer hulls, 15′ long, are scaled-up from the 12′ stitch and glue ama design by Chesapeake Light Craft… then joined with the canoe via simple crossbeams, which may be either laminated wood or composite box beams. 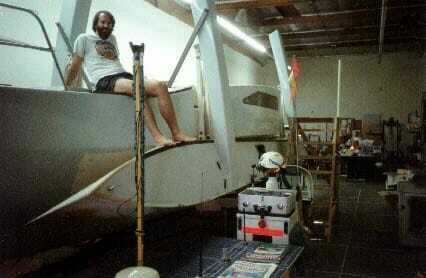 The entire space bounded by hulls and crossbeams on both sides is a folding solar array, totaling 480 watts per boat. We unpacked 16 of the Solarex 30-watt modules and laid them out on the model (as shown in the photos)… and hey, this is pretty! The crossbeams are also hinged, a critical capability that makes all sorts of interesting things possible. First, rafting close together without two intervening solar ping-pong tables is much more sociable. Second, the boats can be rolled up on a beach using deployable wheels, folded, and dragged down the street (they’ll even fit in most garages, as well as my Wells Cargo mothership for the occasional speaking circuit that feeds me). And third, there is a camping mode in which the Microships are parked a few feet apart atop a clearly-marked tent floor, with the folded amas (about 6′ off the ground) providing most of the additional tent structure. This eliminates the need to unpack, allows use of the computers when working “intently,” and vastly improves security. Having two boats that weigh perhaps 500 pounds each instead of one that weighs 3 tons makes a huge logistical difference: with pivoting fat-tire wheels supported at the bulkheads, it is a simple matter to turn the Microships into manageable trailers on a moment’s notice. With one decision, we have eliminated dependency upon the whole nautical infra$tructure of marinas, ramps, boatyards, and a dedicated truck/trailer combo. One other inflexible logistical requirement is on-water bivouac. The inability to support sleeping at anchor was a major failing of the Fulmar — we would tie to a mooring buoy then hitchhike to shore on a neighbor’s dinghy… or pay by the FOOT for marina space then still have to go find a place to camp… or beach the boats and unpack everything to render them marginally light enough to drag above tideline without help. The solution is simple — with a less efficient external leeboard instead of a centerboard trunk, an 8-foot cockpit, and provision for a substantial bimini cover over the operating position, there is enough room to unfold the Thermarest mattress from daytime seat duty and stretch out to catch some Z’s. First, of course, is sail. After a LOT of research over the past few weeks including a trip to Pacific Sail Expo, we opted for the most off-the-shelf and appropriate solution available: stock rigs from the sleek WindRider trimaran of similar scale. These free-standing 93 sqft vertically-battened rigs offer roller furling/reefing around the mast, yet can be lifted out of the bearings and easily stowed for land travel. I’m also awaiting info on a mini-Aerorig from Carbospars, Ltd., scaled to a small UK-made tri called the Challenger, but while high-tech and high-performance, I fear that may not pack as tightly for transport. The second mode of propulsion is electric, and I’m delighted to report that JWA Marine, makers of Minn-Kota motors, has graciously agreed to accept a return of the 24-volt, 70-pound thrust models donated last year and ship in their stead a pair of smaller 12-volt units that can deliver about half as much thrust… along with PWM controllers that will allow our normal thruster power budget to track what’s currently generated by the solar array (approximately 32 amps in ideal conditions, translating, according to hull-speed calculations, to about 5 knots). Although there will be a deep-cycle battery bank on each boat, they are primarily intended for systems… but in an emergency, we should have a few hours of cruising available on a full charge. And third, the Microships will be pedal-powered, and for an old bike-technomad this feels like coming home! On the Fulmar, it was wonderful to have an effective 3-4 knot auxiliary always available, and I have really missed this in the design of the megaboat. Here, we will use a pair of drives handmade by Bob Stuart in Canada (I pedaled a kayak with one of his earlier “kawak” units, and could sprint at an amazing 9 knots or cruise at 7). Andrew Letton is fabricating the removable crank assemblies (they have to be unplugged for on-water sleeping), and extrapolation from Fulmar performance suggests about a 3 knot relaxed cruising speed under burrito power alone. And no, pedal, solar, and sail speeds do NOT add linearly… boats don’t work that way. But it is nice to have options. Incidentally, we seriously considered integrating pedal and electric modes into a single system, but there is no good way to do it that does not involve jackshafts, clutches, speed reducers, and nonstandard hardware. Though it may seem redundant, having separate electric and pedal thrusters adds a lot of reliability and simplicity to the design. The operating position is reminiscent of BEHEMOTH — recumbent seat, pedals a bit higher, rudder-control hand levers, and a wrap-around pressurized equipment console that houses all the computer, nav, and comm gear. As I briefly mentioned above, a full “bimini” cover (like a convertible top) can be deployed over the entire cockpit region, supported at the rear by a sort of roll bar and forward by a Lexan window atop the console. It may be a bit cluttered, with all the control lines terminating in a cramped space, but we’ll do what we can to keep it clean. One of the most pleasant and unexpected aspects of this downsizing is that it caps the proliferation of electronic systems at a reasonable level… it actually took me a few weeks to accept the fact that I was already grasping the entire power distribution and control network. Nahhh, it can’t be THAT easy… but suddenly it is, and I’ve already spec’d the array of Phoenix contact blocks and SSRs that will do the job. A lot of redundancy has gone away, and even such easily overlooked but critical issues as single-point grounding have gotten a lot simpler. I realized the other day with a bit of a startle reflex that the network running on the bench is suddenly a very large percentage of the whole system, rather than just a tentative start. Finally, I have to say that this simply feels right. I’ve delayed writing this report for a lot of reasons… this amazing mailing list includes most of my friends, sponsors, critics, volunteers, consultants, and distant acquaintances; posting something here is always a big decision. This project has gone through a lot of changes since my first tentative maunderings about computerizing a kayak back in 1992, and reactions have covered a wide range: encouragement, impatience, disagreement with technical or lifestyle choices, technical suggestions, vicarious amusement, and quiet tolerance of a long project. 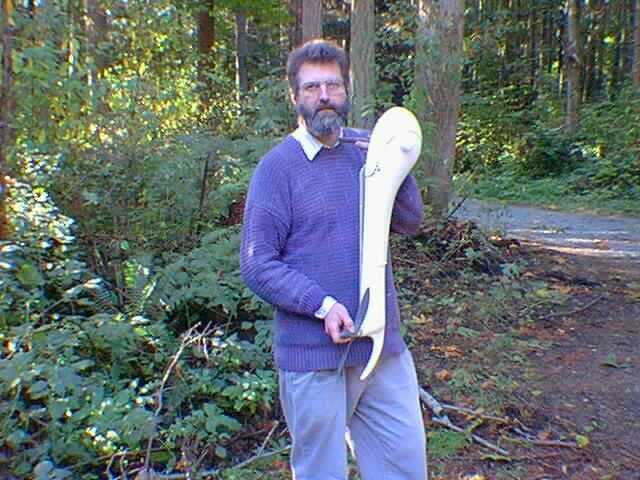 I look back at the early tales, my impassioned discoveries of magic waters intertwined with unrealistic but well-intentioned notions about boatbuilding… and over the half-decade since I have watched my education grow while adventures languish. But now the curves have crossed; I know enough to finish this simply and get back to where I belong — even if it does involve one last change of substrate. And THAT, my friends, is what this is all about. Five years in the lab is turning me into exactly what I fled so long ago, while out there, not really so far away, are quiet coves sparkling in the moonlight, mist-shrouded rivers sussurating through canyons of naked rock and verdant green, sunsplashed beaches that beckon like eternal visions of idyllic summer vacation, campsites abuzz with chittering and aglow with firelight, those first long swallows of cold beer after an all-day haul, the spark of delight in the eyes of a suntanned friend, the rush of a reach that hardens the sail and foams the wake, the magic correlation between dead reckoning and a fix, the astonishment of a satellite email packet, the crackle of a DX contact in the wilderness, the steady blinking of LEDs that bespeak volumes about the systems that drive them, the tales that fly when nomadic spirits recognize each other and pause to share the calm moment of sunset, the adrenaline-pumping madness of nature’s fury, the love, the joy, the perspective, the LIVING……..
Maybe big boats do make more practical sense, but I don’t care. It’s time; the ancient urges are surfacing in a sort of spring fever of the soul. Life is passing; pheromones are in the air; there’s restlessness in the night.